In May-June of 2014 we decided to head west again. Many of our favorite Landscape Photographic destinations are in the west. We (Ron and Joyce) usually take these trips by auto because we try to cover many locations along a mostly predetermined route and need the freedom that auto travel gives us, and the space to pack a lot of gear for an extended trip. The long drive time is the downside of driving from North Carolina (our home base) to western destinations. While in non-scenic transit areas, books on disc makes the time pass faster. So for most of the first few days we were listening to a book while driving to our first destination. Its day four of our trip and the sun is rising in the sky. Our first three days were spent in transient with an objective of getting as far as possible, as fast as possible. We left our mountain home in North Carolina on May 19th and drove across the country to South Dakota for this first stop on our trip. We plan to make stops in the Tetons, and the Idaho Sawtooth Mountain Range before heading into Washington and Oregon to explore these two western States. We drove until we got tired each day, travelling miles and miles of interstate, finding a motel in a small town and a local diner for a quick meal before turning in for the night. The scenery out the car window slipped past accompanied by a book on tape as we made our way toward the northwest. But now, we are in prime Landscape country and it’s time to slow down and smell the roses. It has already been a busy morning. We crawled out of bed when the alarm went off at 4:30 in the early predawn darkness. It’s the Badlands, and we’re excited to be heading out in the chilly morning to capture the rising sun. Cedar Pass Lodge in Badlands National Park has new cabins modeled after the older cabins we stayed in last time we were here, four years ago. These cabins are much nicer and have modern conveniences, like a microwave, mini-fridge, coffee pot and wi-fi. The rooms are nicely decorated in a western motif. There is also a front porch with chairs where one can relax, chat with other lodgers and watch the changing light patterns over the sandstone buttes of the badlands. Bigfoot Pass Overlook is a favored sunset location at Badlands and is located on the Badlands Loop Road. As we arrived at the overlook we could see the clouds gathering in the area the sun was going down. And clouds are always good for sunrises and sets. 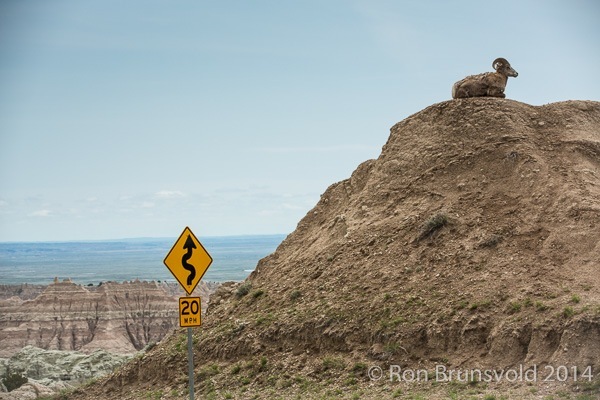 While Ron worked to capture the light I walked out on to one of the buttes and sat on a bench located there. I tried a pencil sketch of the buttes hoping to capture the pinnacles and spires surrounding me. These buttes are constantly being eroded by wind and weather exposing the ever changing bands of color showing the many layers of sediment laid down over thousands of years. The color bands were like ribbons snaking through the landscape from one butte to the next. We stayed until well after sunset, hoping to be able to do some night photography. Ron had looked forward to this spot because it was not corrupted by a lot of light sources. Remote and extremely dark locations are difficult to find in the East, but are relatively abundant in the western U.S. Unfortunately clouds that make a colorful sunset also cover the stars and make for less than ideal conditions for images of the Milky Way. We would have to save this vision for another night and another location. You can see a sunset image (with clouds) in the "Sunrise/Sunset" Gallery. 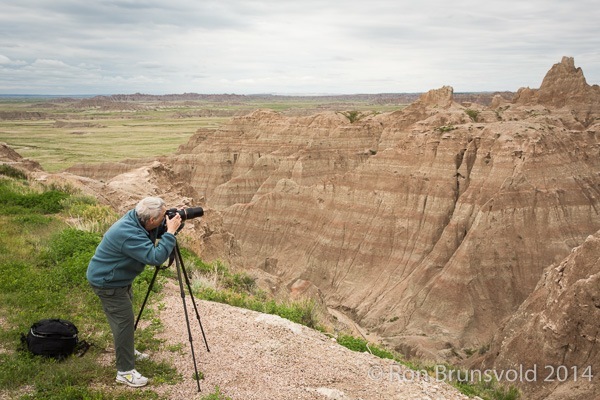 Other Badlands images are in the National Parks Gallery. Our second day in the Badlands found us at The Window Trail, a great location to capture the sunrise. The trailhead is located off Hwy 240 a little before the visitor’s center. This is a short and easy trail. At the end is an area called ‘The Window’, an opening in the rock formations that allows for a view of early morning hikers exploring the Door Trail that winds its way down into the Badlands as it descends and meets up with the prairie beyond. This morning several hikers were wending their way down, stopping often to photograph the morning sun as it rose above the buttes and pinnacles. The May temperatures in the Badlands are pleasant with highs in the sixties, a nice contrast to our last trip here four years ago in late August. Then the temps during the day were in the triple digits with a record high of 107 degrees one miserably hot day. The flora also is considerably different in May with a lot of green vegetation showing. The vegetation is all brown in late August. As we explored this day we found many interesting things to photograph; the graphic lines and textures of the hills with the gully washes down the sides, and the colors of the rocks in the early morning light. The Yellow Mounds overlook area had colorful rock formations. We came across some big horn sheep quite close to the road. One seemed to be posing for us on the top of a ridge. At the Pinnacles Overlook were more big horn sheep grazing in the grass. The Sage Creek Rim Road in the Badlands turns from paved to dirt road and leads to the area ‘where the Buffalo roam.’ There were quite a few buffalo, some of them rather close to our car. Unfortunately, the closest ones were grazing facing toward the sun and not easily photographed. With their dark fur backlit, the lighting was too contrasty for much except silhouettes, but they were interesting to watch. Robert’s Prairie Dog Town was covered with prairie dogs poking their heads up out of their mounds running around exploring. They were alert to any movement and would quickly dart back inside at the sight of a human, but seemed less threatened by the curious studying them from their car windows. For a break, Wall Drug store, in the close by town of Wall, was a perfect place to catch lunch. It has an interesting history and is a good spot for finding souvenirs and tee shirts. They still offer free ice water to anyone who requests it and coffee for 5 cents a cup. Free cold water was a big draw for the Drug Store in its early history. Many people came to explore this dry area in the summer and found very few places that offered such amenities. We enjoyed our lunch here and enjoyed the many pieces of art work that adorned the walls in the dining areas. Next on our agenda was Jackson, Wyoming and the Grand Tetons. In Buffalo, Wyoming we left the interstate travelling on Hwy 16 over the Powder River pass and down into the town of Ten Sleep. Ten Sleep was named after the Native American way of counting the number of nights to travel to an area. The area was very scenic as we climbed to 9,677 feet to the top of the pass. Snow still covered the ground at the top and the temps were still very cold, but roads were clear and good for traveling. As we descended we passed a pretty lake and followed a river. 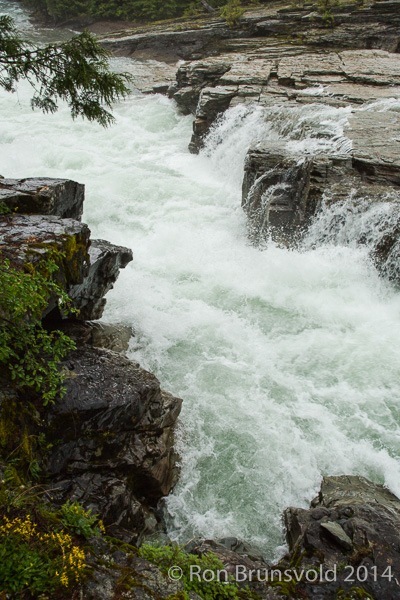 There were some nice cascades and rapids as the water rushed down towards the lower elevations. I don’t remember the name of this river, but I know that we drove along beside the Wind River as we headed south toward Riverton, where we would stay the night. The next morning found us heading west again toward the Grand Tetons. Climbing in elevation we again found snow on the ground outside our car windows and got our first view of the snow covered peaks of the Tetons, arriving early enough to do some exploring before heading into Jackson to find our lodging. We parked near the Dam that spans the Snake River. A coat felt good as we crunched through the snow, and headed into the wind and out onto the Dam to take our first photos of the Tetons. We enjoyed our time in the Tetons in spite of some bad luck. Ron twisted a knee trying to stand on a stump to get a higher angle for photographing the Mormon barns with the Tetons in the background. The first day or so afterward he had a pronounced limp. Another bit of bad luck involved a slow leak in one of our car tires. There is a lot of construction going on around our motel and we suspect we drove over a nail. As it was Memorial Day weekend, we had to wait from Sunday until Tuesday to find a place open to repair it. As a result of both bits of luck, we did not venture far from our vehicle when we went out to photograph. We also stopped several times a day to put air in the tire, finding this easier that putting on the spare. One of our favorite Tetons sunrise locations was closed due to construction in the parking area. We were not able to access Schwabacher Landing (major bummer). 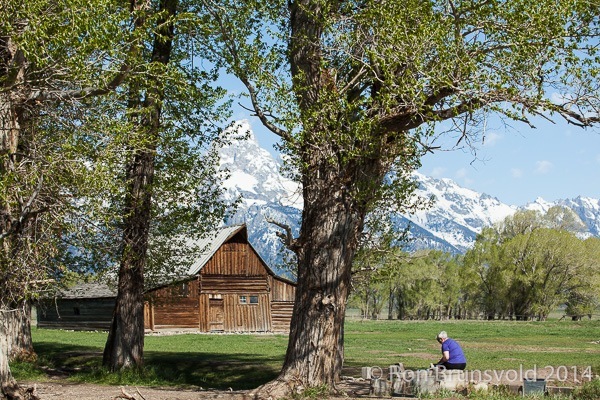 Instead we photographed each morning at the Mormon Barns and each evening either the barns or at Oxbow Bend. You can see one of the Sunrise images across the Snake River with first light on the Tetons in the "Sunrise/Sunset" Gallery. At least Ron has some great photos from Schwabacher Landing taken on a previous visit. The weather was good for being out of doors, sunny and pleasant, but that meant uninteresting skies for color at sunrise and sunset. However, it did mean that we could try night photography. 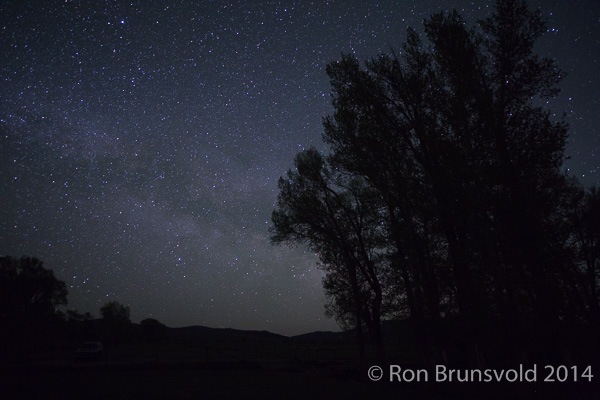 Ron talked to another photographer who had been out the night before at the Mormon Barns location to photograph the stars. After a sunset shoot at Oxbow Bend we relocated to the area around the smaller of the two most popular barns to wait for the last glow in the sky to fade. It was very cold and the area was very dark on this moonless night once the sun had disappeared. I decided to stay in the vehicle while Ron photographed. I could tell where he was by watching for his flash light. He turned it on to make adjustments on his camera, to avoid the many pot holes and to occasionally light paint the side of the barn. After he returned to the car we stood around some just enjoying the beautiful clear night with the stars twinkling overhead. 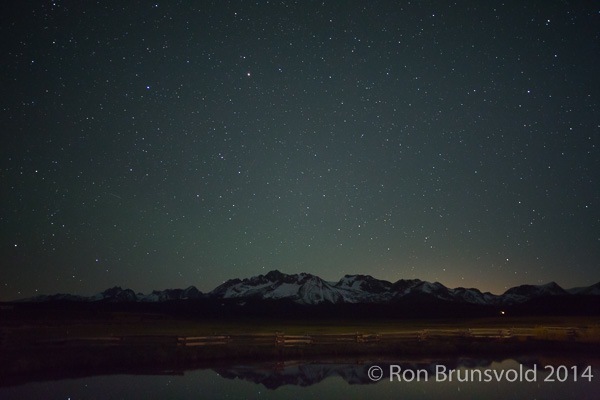 If you have never been in a really dark sky location, you will be amazed at the difference it makes in the night sky. We also photographed one morning from the trail that borders String Lake. We captured a colorful red canoe that moved into the lake with a backdrop of snow covered Teton peaks. There were also nice reflections of the mountain range in the lake. Much of the perimeter trail was still snow covered and very icy and slippery. I got the opportunity to do some more pencil sketching while we were there. I particularly enjoyed sketching the barns and the surrounding fences. The structures were simple and let me practice showing depth and perspective by the angle of my lines and by shading. I also included a horse, although not very well drawn. 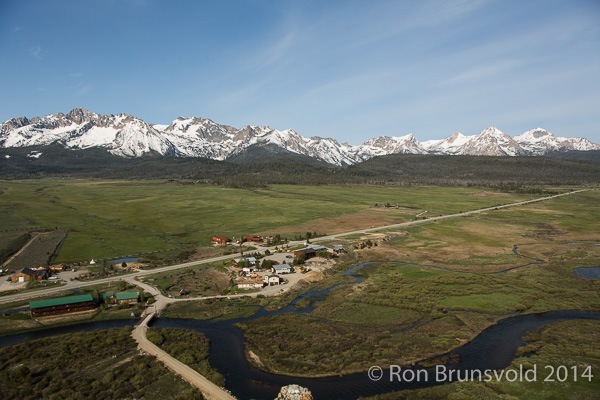 The trip to Stanley, Idaho along the Sawtooth Mountain Range was very scenic. After turning onto Hwy 75 we passed through the ski towns of Hailey and Ketchum. Just past Ketchum, the road begins to climb in elevation. The Galena Overlook near the Galena Summit at 8,701 feet affords a wonderful view of the valley and the surrounding mountain range. Ron photographed while I shared travel experiences with a couple we met from Boise. We came down in elevation and stopped to photograph from a bridge that crossed the Salmon River. From the bridge you could get an image of the cascading river with the Sawtooth Range in the background. Red Lake and the Red Lake Lodge also made interesting stops before continuing on into the town of Stanley. The town of Stanley is very small and VERY scenic. The valley was surrounded in all directions by the snow covered, ragged mountain ranges. It did indeed remind me of the teeth of a saw. We did not have to drive far to find things to photograph. Our hostess at Valley Creek Lodge, Victoria Mumford, was very informative about good places to try. She is an artist and has a definite eye for scenic locations. We were surprised and delighted to learn that she and her husband Herbert, had moved to Stanley from Montgomery County, Maryland where Ron and I had lived and worked for 30 years. It was like meeting an old friend as we talked about familiar places, even though our paths had never before crossed. An area above the motel accessible by a limited access dirt road gives a wonderful view of the mountains with the town and the valley stretching out below. West on Hwy 21 is the turn off to Stanley Lake. This beautiful lake had a campground and a nice walking trail. We were able to get nice reflections in the lake of the snow capped mountains. And, we got the opportunity to do more night photography – this time by just walking across the highway from our lodging to a small pond. The pond had a split rail fence just past it and the mountain peaks beyond that. This time I stayed out in the dark with Ron. I helped to light paint the fence as it and the mountains reflected in the water. It was a very clear and very cold night (mid 20s), but one of the most beautiful places I have been. We came back to this same pond the next morning to photograph the sunrise. More images from around Stanley are in the “Northwest" Gallery. Leaving Stanley, Hwy 21 goes west through an area prone to snow avalanches. In fact there had been one that closed the highway for quite a few days in March of this year. There was still snow piled high on the sides of the road through this area. It was mixed with trees and limbs that got swept down the mountain side along with the snow. We did not follow this highway all the way into Boise, but instead took the shortcut recommended by the couple we had meet at the wayside viewing area on the way to Stanley. It took us through Lowman and Garden Valley and saved us several hours in travel time. We then turned north onto Hwy 55 and then Hwy 95, following along beside the Payette River for part of the way and stopping to photograph the water cascades. 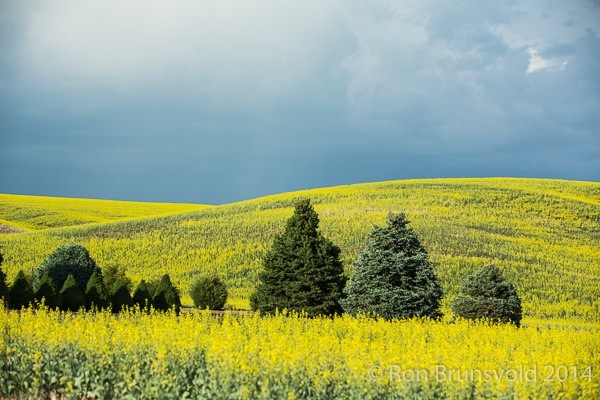 As we approached the Idaho-Washington Border the landscape changed to rolling hills, and we saw our first canola fields. They were such a vivid yellow against the blue sky. We could not find a spot to get off the highway to photograph but looked forward to finding some of the same fields in The Palouse. Arriving a day early in Colfax, we were able to check in at the Siesta Motel where we had reservations for the rest of the week. We checked in, saw a Chinese restaurant across the highway and had dinner and then went exploring. We were so excited to be here and could not wait to get out and see the surrounding countryside. We spent a week photographing in the Palouse Region of Washington State using a map of the area that Ron had found and purchased on the internet from a local photographer who knew the area well. He had marked the location of barns, farm machinery, windmills and scenic areas. We used a yellow highlighter to mark the roads as we travelled them as there are so many back roads that go across the fields and from farm to farm. We wanted to explore as many as possible without doing too much backtracking. The road signage was useful, but it was still easy to get turned around or disoriented on these farm roads. 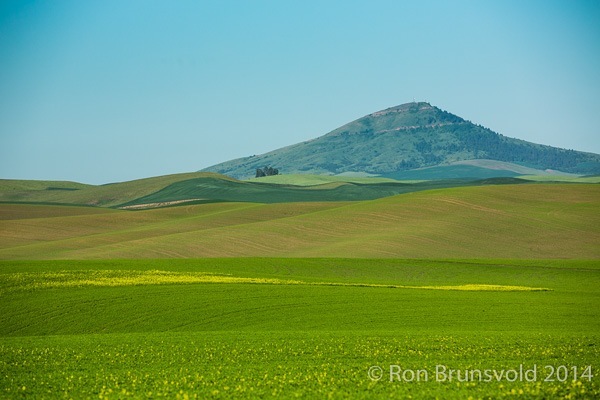 The Palouse area is full of rolling hills, wheat crops, plowed fields, and wild flowers. Our first morning started with a visit to Steptoe Butte, one of two high points in the area. From that vantage one can see 360 degrees as the road winds its way around the butte, climbing to the top. Our telephoto lenses came in handy in capturing many images of the graphic designs below us. We saw every shade of green and brown and many compositions with S curves, C curves, angles and leading lines. What we did not see were yellow canola fields. As we explored those first few days, we kept our eyes peeled, expecting to see them around every curve and as we crested every hill. We also asked at the motel, at cafes, and of other photographers. We went on several wild goose chases. We did find the barns, windmills, and many scenic areas to photograph. We found a particularly scenic lone tree growing among the fields of wheat and silhouetted against the blue sky. On one of those chases we drove almost to Spokane and finally found a small field of canola. Unfortunately it wasn’t very photogenic. 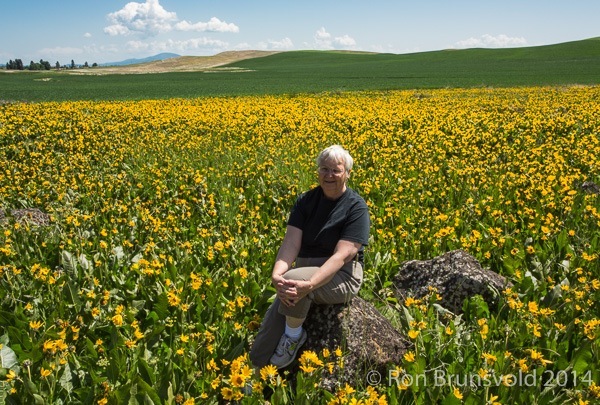 We settled instead for a beautiful field of yellow balsamroot flowers surrounded by crops. As we photographed the field of flowers, we were approached by a local woman driving an old truck. She was concerned that we were photographing her barns and horses and didn’t believe at first that we were just interested in the wildflowers. She said that some of the farmers around had had horses stolen and houses broken into so they were very wary of strangers. She warned us of stopping and photographing in the area. With some trepidation, we departed the area and headed back toward Colfax. 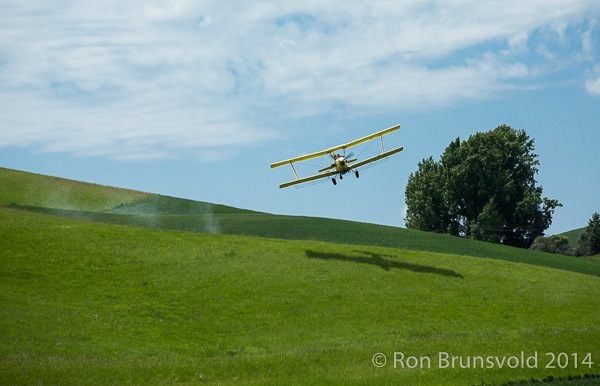 On the way back we saw two colorful crop duster planes and chased them. We got some images, but learned that they too were wary of photographers. They feared we were environmentalists who would use the images to protest spraying in the area. I’ve always found it best to listen to any concerns of the local populace and to be compliant with their wishes. Even though I am on public roads, I want to maintain goodwill toward photographers. Most of the locals were very friendly and helpful. We headed out that way before sunset. We found and photographed a covered bridge on a side road along the way. Four miles past Dusty we still had not found the fields and were ready to chalk it up as another wild goose chase. At the next side road, we turned around to head back, but as luck would have it, it was onto a road that paralleled our first real canola field. As we were photographing the owner of the farm drove by and stopped. He was very friendly and directed us to several more fields in the area. The skies were darkening with an approaching storm allowing for great images of the yellow fields, mixed with green wheat fields and brown plowed areas, set against a stormy sky. We took a day to rest, and made a last sunset visit to Steptoe Butte, before heading out the next morning for Palouse Falls. Many examples of abstract patchwork landscapes from the Palouse area can be found in the “Palouse” Gallery. 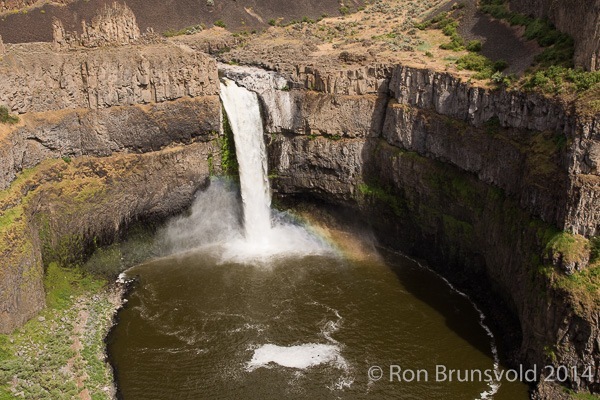 Palouse Falls is in the middle of an area with very few facilities and no lodging other than camping. Usually the state park closes at sunset. We were one of about 4 couples camping overnight. We decided to camp so that we could be there for a late sunset photo and also to do some night photography. We have seen beautiful images taken of the falls at both of these times, but we were not very successful with either. The skies were clear and cloudless which did not make for a great sunset but gave some possibilities for night photography. Unfortunately the moon was almost full and hid many of the stars. The moon was also in a spot that caused the cliffs surrounding the falls to cast shadows over the water and over part of the falls. We tried some light painting to add light back to the areas in shadow, with limited success. We slept poorly as we were not really prepared for camping in cold night time temperatures and the area did get rather chilly once the sun went down. We woke early after a fitful night and broke camp. We were on our way toward Oregon by 5:30 AM, and looking for a place to get a hot cup of coffee and breakfast. 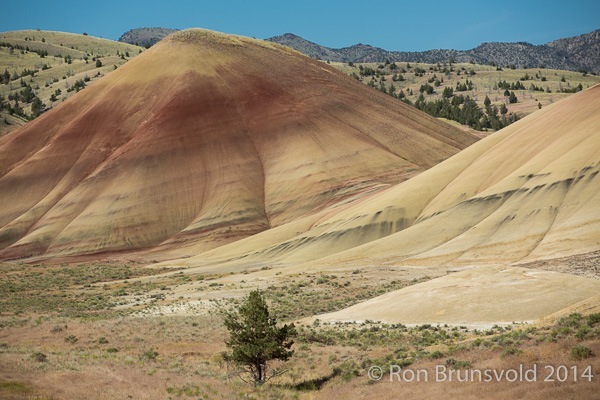 The Painted Hills area (part of the John Day Fossil Beds) in Oregon provided us with a much needed break from being in small motel rooms and on the road. We stayed in Mitchell, Oregon at the Painted Hills Vacation Cottages. The small Hollyhock cottage was just right for a couple. We were greeted on our arrival by Aruna Jacobi, one of the owners of the cottages. When we mentioned that we planned to cook our own meals during our 4 day stay, she offered to contact a local farmer to make arrangements for us to stop by to purchase some fresh vegetables. The Trading Post in the town of Mitchell offered limited grocery selections, but with the condiments that Aruna keeps on hand for their lodgers and the fresh vegetables, we were all set for being able to prepare our own meals. This was a nice break from restaurant and fast food places. The Painted Hills were much more geographically compact than what we had anticipated after visiting the sprawling Badlands in South Dakota. As were drove out to the Painted Hills area we began to see a few painted hills mixed in the farming areas that surround the park. The hills contain a palette of yellows, reds, blacks, and grays. The color intensity is affected by the angle of the sun, clouds and moisture from rain. The main road into the hills gives access to several hiking trails. The area is very fragile and visitors are frequently reminded to stay on the trails and off of the hills, by signs posted along the road. There are four trails that are available, three of which are easy ¼ to ½ mile trails. The Overlook trail is a good sunset spot, easily accessed by car and then by a short ½ mile hike with a nice overlook of the hills. The Carroll Rim Trail is a longer and more strenuous hike but allows for a panoramic view of the whole area. There are several places along this hike for panoramic photos if you can’t make the ¾ mile climb to the top. The other two trails are in the back section of the park and involve easy, flat, ¼ mile hikes. The Painted Cove trail allows for a closer look at the reddish hills and The Leaf Trail is an area that includes glimpses of some of the fossils embedded in the hills. We photographed mostly from the Overlook Trail and the Carroll Rim Trail. We found and photographed many wildflowers blooming in the fields along the Overlook Trail and around the Painted Cove Trail areas. Many examples of these images are in the “Painted Hill” Gallery. Moving on down the road, the next day found us travelling thru scenic areas that included snow covered mountains, cascades, and waterfalls as we continued to explore Oregon. 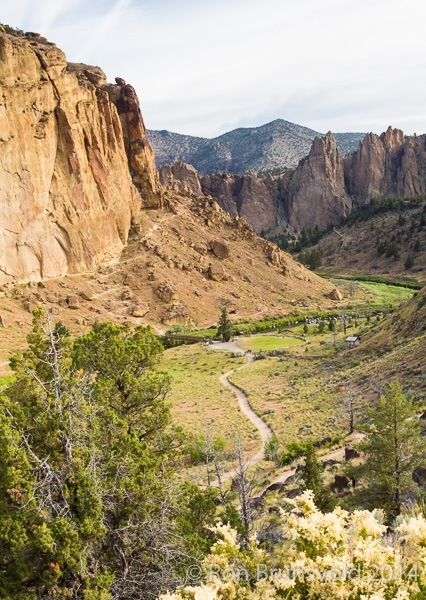 We stopped first at Smith Rock State Park located near Redmond, Oregon. This is a very scenic and popular park that includes many hiking trails along a river that winds through a steep canyon. It also is a popular place for rock climbers. On the morning we were there, several foot races were taking place. It was interesting seeing the runners descend from the gathering spot in the parking areas on a trail that sloped down to a creek. There they crossed a bridge before climbing on the other side up a steep trail that wound around and through the cliffs. There were many good spots to get a panoramic view of the area from a trail along the rim right just off the parking lots. From this viewpoint it was also possible to see the climbers beginning their ascent up the rock faces on the cliffs above the river. From here we took a scenic and roundabout route to Proxy Falls. The more direct route over McKenzie Pass was still closed due to snow. Proxy Falls is about a mile roundtrip hike from the adjacent parking area. The trail is very rocky and in some places moderately steep, but very doable. The falls can be viewed and photographed from an area along the trail. There is signage for the trail to the falls and for other longer trails into the forest. I must say that the signage can be confusing, so if in doubt, just wait a few minutes and usually someone will pass by who knows the area and can point you down the correct trail. One trail goes down a steep path to the bottom of the falls. However, the falls view from the bottom is blocked somewhat by limbs and brush. To get to the best views, be prepared to walk in some wet and muddy stream beds. The climb to the bottom is steep and slippery in spots. There were large downed trees to either crawl over or under to reach the bottom. After exploring the falls we made our way over to I-5 and drove south until we got tired. 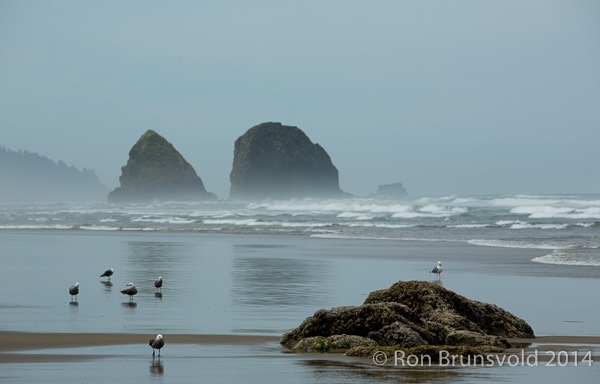 We were looking forward to the Redwood National Park in Northern California and then on to Brookings, Oregon for the beginning of our trip up the Oregon coastline. 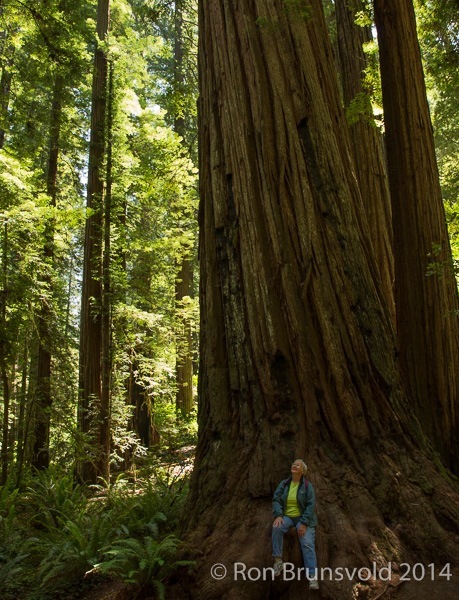 The Redwood Forest was, as you would expect, impressive. The dirt roads in the section we explored were also quite dusty. We limited our visit the northern most part of the Forest, but still saw many old and very large trees. The area was deeply shaded due to the dense trees towering above us. We took a short hike to explore and photograph more closely before continuing through the forest and then on to Brookings. The Wild Rivers Motor Lodge was home for our two nights in Brookings and photography in Harris State Park. We photographed mostly at sunset in this area. It was still quite chilly and windy so we bundled up before going out. The first evening we sat in the car overlooking the coast, waiting for the sun to begin its decent. As we sat there Ron noticed water spouts coming up out of the water and realized that there were several whales playing in the inlet below where we sat. They never came close enough to photograph but they were close enough to see as they surfaced to blow air out of their blowholes. We looked for them the next day but they had moved on. We moved on further down the beach to get a good vantage point of the sea stacks with the sunset. Our next stop was in Bandon Oregon, where we stayed for four days. The Lamplighter Inn provided inexpensive lodging in an area with many photo opportunities. Most of our photographing was centered in Bandon Beach State Park. The parking lot at the park is on a high cliff overlooking the beach and the sea stacks all along the shore. There were several long stairs going down to the beach and each one led to a different vantage point. Coquille Point overlooked interesting sea stacks and tidal pools. There was a path around the overlook that had many interpretative displays to tell about the plant and animal sea life and about how the sea stacks may have been formed. The beach below this area was also a wonderful place to walk and explore. We found starfish and sea urchins clinging to the rocks that rose up out of the surf. At low tide you could walk around and explore these rocks up close. At high tide you could get wonderful images of the waves slapping against them. The time of year was not the best for getting wonderful sunsets, but the setting sun reflecting in the tidal pools gave some interesting images. We also found many patterns in the wet sand to photograph as the tide went out. 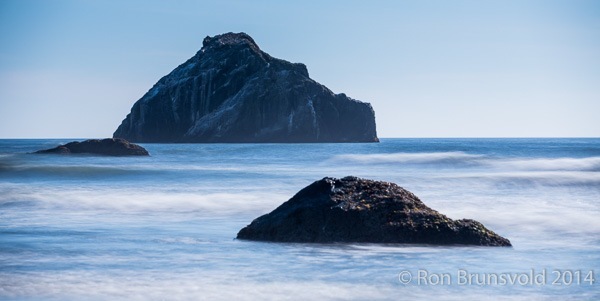 More images from the Bandon and Ecola area are in the “Northwest” Gallery. The next afternoon we explored the beach from the Face Rock overlook area. This was the second long set of steps leading down to the beach. One could walk along the beach between these two areas, and also get very different compositions and views of the setting sun from these different vantage points. One afternoon we saw four riders on horses trotting along the beach at low tide among the sea stacks. The sea stacks had such descriptive names. Face rock looked like a profile of a young maiden’s face. Guardian rock stood as a sentinel keeping watch. I was able to take long walks along these beaches and got plenty of exercise both walking and climbing back up those long stairs to the parking area. This place calls itself the winter storm capital and we would love to come back here in winter. There are several motels right on the cliff faces overlooking the sea and the beach. It was windy at times and I could imagine the wind howling in the winter. On one of our days at Bandon we drove up to Sunset Bay and Cape Arago State Parks near Coos Bay. While Ron photographed the Cape Arago Lighthouse, I took close up photos of the ferns and flowers on the trail to the lighthouse. I found some vines with curling tendrils that made wonderful simple graphic compositions to photograph with my macro lens. As we travelled to Garibaldi the next day we made several stops along the way. Our first stop was to photograph Heceta Head Lighthouse. Coming from the south, we looked for the turnout just past the sign for the Sea Lion Caves. While Ron photographed the lighthouse I watched the sea lions on the rocks just below the lookout area. I watched as one sea lion made multiple attempts in the strong surf before being able to pull up on the rocks. He actually let the waves wash him up and then just rested awhile before pulling himself further up. The traffic here was pretty busy and we had to be careful as we pulled back onto Hwy 101. 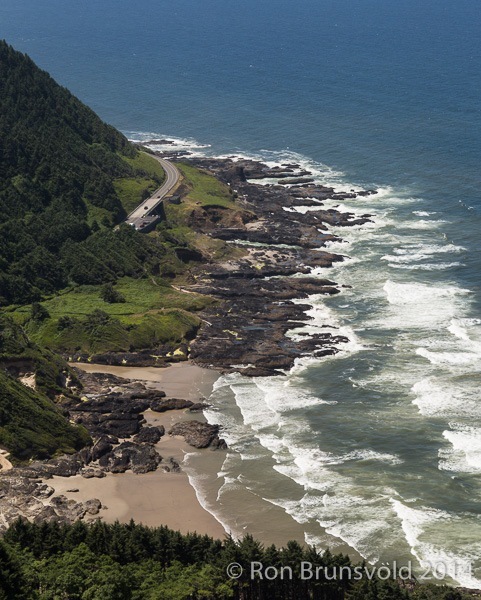 Cape Perpetua is the highest point on the Oregon Coast and offers amazing views of the coastline in both directions. It is a national park site and requires an entrance fee. There is a visitor center where information is available and fees can be paid. Cape Perpetua can be reached by a 2 mile drive up a winding forest road. This road is about 2 ½ miles south of Yachats. There are several viewpoints along a very easy hiking trail to the point. I enjoyed photographing some wild flowers and ferns along the hiking trail while Ron photographed the view of the coastline that stretched for miles below this high vantage point. We arrived in Garibaldi early enough to wander around the docks to photograph. Ron also photographed an historic train engine in a city park near our lodging. As we left Garibaldi heading north we stopped to photograph The Three Graces. This is a grouping of three rocks at the entrance to Tillamook Bay. We saw boats heading up the channel going out to sea here. The access was a little tricky due to the best vantage point being across a set of railroad tracks. Hug Point was our next stop. At first we thought this was just a nice beach with some rocks protruding out of the water. But as we walked and explored around an area where the cliff jutted out almost into the surf, we came upon a waterfall there on the beach. We had read that one of the parks that had a waterfall on the beach but we discovered it only as we explored. There were also several caves along the beach. Hug Point is accessed by a short hike from the parking lot located on Hwy 101. Cannon Beach, our next stop, is a very nice beach resort area. There are many art galleries, restaurants, and lodging choices. Tourist abound! The prices here were more expensive than some of the other areas we had stayed along the coast. We found reasonably priced lodging at Tolovana Inn right on the beach. With four buildings, many choices of room types are available, some with views of the beach and the sea stacks. Nearby Seaside seems to be less upscale and with some fast food choices. The main attraction for us at Cannon Beach was Ecola State Park. There is a great view of the beach from Chapman point just a short walk from a parking area. We visited this park for both sunset and sunrise. Sunrise was a little more challenging since the park does not open until 6:00 am. The gates were not closed so we decided to go in early. We were told that the state police patrol this area looking mostly for people who are camping out on the beach, as this is not allowed. We arrived in the early morning before sunrise, although it was already getting light. As we walked out to Chapman point, where we wanted to photograph, an elk rose up out of the grass on a hillock beside us, perhaps 75 feet away. He watched us. Then two other elk that had been sleeping nearby, rose up also. All three watched us for a bit and then wandered off on up the hill. The Indian Point section of Ecola Park is the other must see area to photograph. Here you could get a better view of the lighthouse that is a mile off shore, but it was still too far out to photograph well. I enjoyed photographing the flowers while Ron photographed the beach and the sea stacks. There were some beautiful thistle plants and wild roses. I also found some slugs crawling on the leaves in the early morning dew. Leaving Oregon we drove across the Columbia River into Washington State and headed west toward the small seaport of Ilwaco. This was the most picturesque seaport we had found so far. At the harbor there were working boats with busy fishermen making repairs and performing maintenance, and warehouse buildings where their catches were being processed. This was a wonderful place to photograph using both wide angle and close up lenses. We captured frayed ropes, oil slicks on the water, colorful buoys and old weathered boats in the storage lots. Cape Disappointment State Park is located just outside of Ilwaco. This park commemorates the point where Lewis and Clark reached the Pacific Ocean. Cape Disappointment was thus named by Capt. John Meares in 1788. Capt. Meares was searching for the Columbia River but was disappointed when he missed the passage over the bar crossing to the river. In 1792, Capt. John Gray successfully crossed the bar and entered the river, which he named the Columbia, after his ship. Cape Disappointment has two lighthouses. 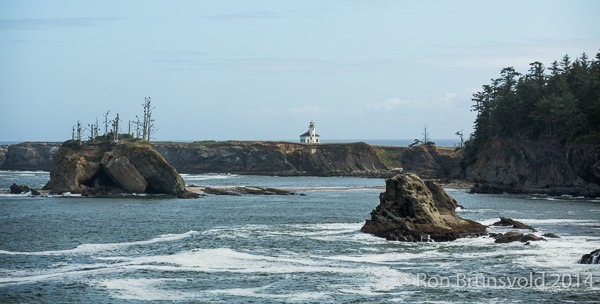 The Cape Disappointment Lighthouse can be viewed from the visitor center at the point. Northhead Lighthouse is accessible by a short trail from a parking area. On the day we were there, a docent was manning the lighthouse and allowed tours. There are signs for reaching both lighthouses along the park road. The Foxglove was in full bloom along the sides of the road and in the parking areas. I was able to get many pleasing images here while Ron photographed at both lighthouses. From Cape Disappointment we traveled back through Ilwaco and headed north for Olympic National Park in Northwest Washington State. Our room at Kalaloch Lodge overlooked the ocean and the beach which was just a short walk down from our lodging. After we checked in and rested a bit we went to explore. The main thing that impressed me at this beach was the quantity and sizes of driftwood. There were whole, big trees that had washed up on shore. There were also many tidal pools on the beach. We reached the beach by walking through the cabin area and down to a gazebo. The trail down to the beach started here. Some of the driftwood logs had been stood up on end to make a scenic retaining wall along the cliff. We had an excellent meal in the Kalaloch restaurant that night. The lodging and the food were both expensive (the most expensive of our whole trip) but it was a beautiful location. The next morning I slept in but Ron got up to take some sunrise photos. We then packed up and headed out to explore Olympic NP and the Hoh Rainforest. Our first stop along the way was Ruby Beach. It was located right along Hwy 101 less that 10 miles north of Kalaloch. Ruby Beach had some interesting sea stacks as well as more driftwood. It was misty on the beach and very scenic. 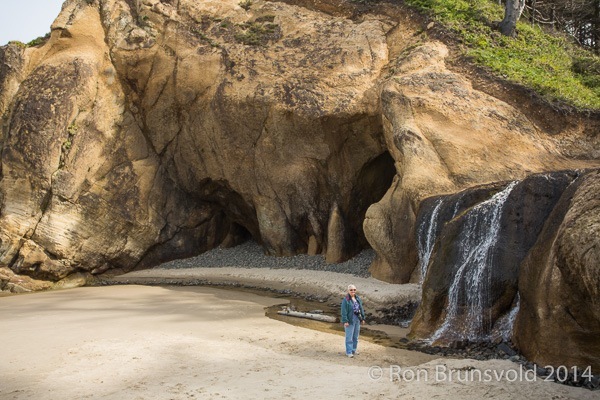 A ranger we had met in Ecola State Park in Oregon had told us that Ruby Beach was his favorite beach. Ron took a beautiful photograph of a curved pattern etched by the surf in the sand. The pattern was made from little rivulets of water that were running back into the sea, from where the high tide had drained back out into the ocean. One of the larger and prettier sea stacks was in the background. We also walked along the beach and crossed over a stream that drained into the ocean. There were logs laid across the stream to walk on. Only the logs were not real stable. I used a driftwood stick to help me balance and still ended up stepping into the water when one of the logs shifted. On the other side you could continue along the beach and get closer to other sea stacks. We spent about an hour here before heading on to the Hoh Rainforest. Following the signs on Hwy 101 we easily found the access road for the rainforest. It was a long, 18 mile drive to get to the visitor center. Some of it followed along the scenic Hoh River. From the visitor center it was an easy hike into the rain forest. We crossed a stream early in the hike. It was a very clear stream and you could see the grasses and plants swaying with the current beneath the surface of the water. We were on the Hall of Mosses trail and found that it was very aptly named. 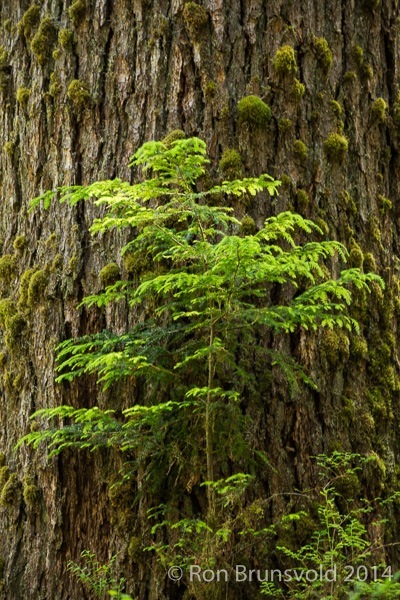 Mosses grew up the trees and hung down from the limbs. There were conifers as well as a few maples growing in the area. Everything was very green, but not as wet as I had expected. I’m sure that was due to the time of year we were there as well as the draught that is affecting so many of the western states this year. After checking out the small visitor center we headed back to Hwy 101 and north into Forks, Washington where we planned to stay for the next two nights. The Dew Drop Inn in Forks was clean and reasonably priced. After checking in we found a small drive in on the edge of town and got some barbeque. It was a bit of a disappointment because we have access to some of the best barbeque in the world in our home town in Western North Carolina. I guess it wasn’t a fair comparison. At the restaurant we saw lots of references to the movie, Twilight. The movie was not filmed in Forks but some scenes were because Forks, Washington is the setting for the story. We turned in early with plans to visit Realto Beach early in the morning. The morning started out foggy and was misty wet by the time we reached the beach. There was an occasional light drizzle as we explored. Many of the sea stacks were shrouded in a heavy fog and mist, occasionally clearing enough to photograph. Again there were a lot of huge tree trunks with their roots that had washed up onto the shore. On a clearer day it would have been possible to photograph a sea stack framed by the huge holes in some of the trunks. We both walked a long way along the beach toward an area called Hole in the Wall. We turned back before reaching it since the tide was coming in and we did not want to get caught by tide and a disappearing beach and not be able to get back to our parking area. The cliffs sometimes come all the way out to the water line and you can get caught on the far side of one of these areas as the tide rises. Then you just have to wait until the tide goes out and the water line recedes. Back in the parking area I found some flowers growing on vines that were covering a hedge. They were very colorful, with oranges, yellows, reds and whites on the same flower. They seemed vaguely familiar but I did not know what they were called. Later I realized that they reminded me of honeysuckles. When I looked up images of honeysuckles on Google I found photos of the same kind of flowers. The honeysuckles I see in the East are mostly just yellow and white and do not have as many ‘suckles’ in one flower. The next morning we got up early, packed and headed for Hurricane Ridge on the North side of the Olympic NP. The access road for this area begins at Port Angeles, Washington. 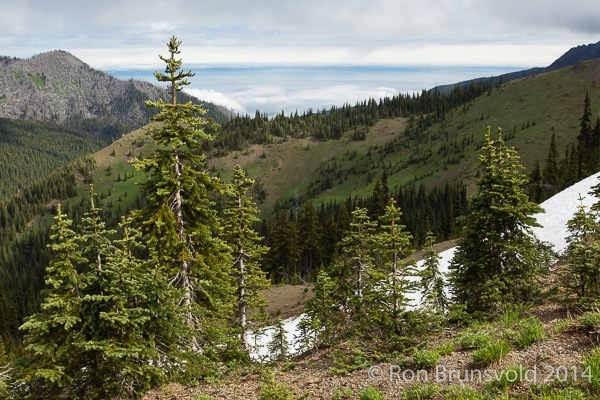 The drive to Hurricane Ridge goes through some beautiful scenic areas as it climbs up the mountain. We saw road clearing equipment and warnings about mud slides. Indeed we saw areas where there had been mud or snow slides coming down the mountain that had cleared all of the trees from that slide area. Hurricane Ridge is very aptly named as the wind felt as strong as a hurricane. It was also cold, especially in the visitor center parking area where there was nothing to block the wind. Once we were on the big Meadows loop trail the wind was blocked and it did not feel as cold. We saw some Avalanche lilies and a few other wild flowers on the loop trail that begins and ends in the visitor center parking area. We also saw some black tail deer resting in a meadow beside the trail. They seemed pretty acclimated to people and did not move away until we got right along beside them. We did not go too far along the trail as some of it was blocked by snow drifts that had not yet melted. We got back in our car and drove on up past the visitor center to Hurricane Hill Trail. The ranger had told us that there were more wildflowers along this trail as it received more sun. We were not disappointed. We saw plenty of lupine, indian paintbrush, avalanche and glacier lilies and other flowers that I did not recognize. They were not as profuse as we had seen in the Colorado mountains but they were close to the trail and easily photographed. The snow covered mountains in the distance were also very scenic. We left Hurricane Ridge and returned to Hwy 101 heading east and then South. We drove around the Puget Sound and down through Tacoma, Washington. We were heading out of Washington State and back home. We had one last stop on our trip and that was Glacier National Park. We planned to drive as far as we could before stopping for the night, but mostly wanted to get over to Interstate 90. We made it to the interstate and as far east as Ellenburg before we stopped for the night. The next morning as we approached Spokane in the upper regions of the Palouse Area, we passed a field of Canola. The bright yellow fields were too much to resist. We got off at the next exit and got out our local maps looking for a road to lead us back to the field. We made a right onto a road that ran parallel to I-90. After about a mile the road curved around and ran alongside the canola fields. The yellow bands of canola were bordered by green fields. There was a lone tree near the top of a hill that was silhouetted against the fields and against the blue sky. There was also a small grove of trees in the middle of the field. We found this side trip well worth the hour or two delay. We drove through Spokane leaving Washington behind and entering again into Idaho. This section of Idaho is equally as scenic as the Sawtooth area, especially the area around Coeur D’Alene. The interstate borders the lake around this area for many miles. Coeur D-Alene Lake was also surrounded by mountains, many of them still snow covered. We stopped only for lunch at a rest area before continuing on through Idaho and entering Montana. After only about 30 miles into the Big Sky state, we left the interstate and headed north to Glacier. The day was partly clouded and we saw some black clouds in the distance but we did not run into any rain; at least not until we entered Glacier. We only planned to stay two nights at Glacier. Upon arriving in Glacier NP, we learned that the Going to the Sun road was still not open. Usually it opens around mid-June, but here it was June 28th and there was still no projected date for when the snow and ice would be cleared. When we arrived at Glacier, we could not see the mountain peaks. They were shrouded in clouds. It was also misting rain. We checked into our lodging then decided to drive a ways up the Going to the Sun road to see a few of the sights. We took a few photos before heading back toward Apgar Village. We had been on the road all day and we were ready to find some food before settling down for the night. After breakfast the next morning we headed over to the Visitor Center to take the park shuttle up as far as we could on the Going to the Sun road. The shuttle went further than private vehicles were allowed. We waited in line for about 45 minutes and still had several bus loads of people ahead of us. The buses only held about 15 passengers and ran every 20 minutes so we figured we still had another hour to wait. Since the forecast was for rain by noon, we decided to abandon the idea of taking the shuttle and instead just drive as far as we could on our own. We headed back up the Going to the Sun Road. Along the way we stopped at Avalanche Creek to photograph the water rushing over the rocks as it cascaded down the mountain. The water was more powerful and rapid than any I had ever seen and the roaring was so loud it drowned out conversation. The mountain peaks were still shrouded by clouds and mists but we got some nice images of the roaring creek. By this time the rain had begun, arriving earlier than predicted. We pitied those who had made it up on the shuttle bus. They were most likely dropped off in the rain, and were cold and wet in the heavy fog waiting for a ride back down the mountain. Sometimes things do work out for the best. We continued on up the road as far as we were allowed before turning around and heading back to our warm dry room. The rain was predicted to continue the rest of the day, so we made the decision to leave early. Maybe we will get to come back someday and see Glacier and all of its majestic scenery in better conditions, but it was not to be this time around. It took us three days and nights on the road to get back home and to our own beds. We continued from Montana into Wyoming and then into South Dakota, following I-90 all the way to Sioux Falls where we spent the next night. The third night we stopped just East of St. Louis, Missouri. We made it the rest of the way home on the fourth day, arriving in the late afternoon. The weeds were high in our yard and we had no food in the house but it was SO good to be home. We were both looking forward to sleeping in our own bed again. Our six weeks on the road had given us the chance to explore many new places and to see a different part of our wonderfully scenic country. We saw many beautiful areas, but the view of the Blue Ridge Mountains outside our window is an equally beautiful place to call home. You can see some of Ron’s photographs from this trip as they are gradually added to the Gallery section of this web site.